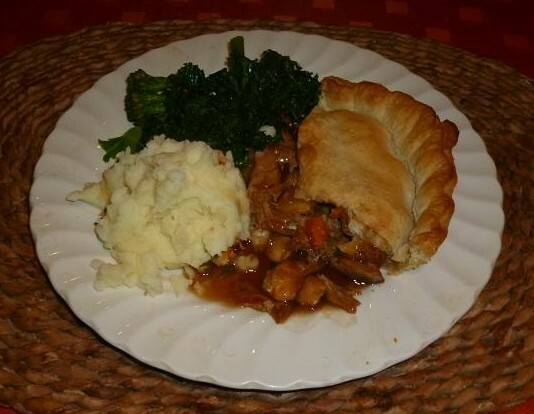 There are many ways to cook rabbit, some exotic and some plain, but you can’t beat the old country recipes, when it comes to a rabbit pie. Long before supermarkets and freezers, a rabbit would be brought home to be cooked up with whatever was in the larder, or garden that day, then baked in a pie for consumption at a later time. Arriving home with a big buck rabbit from my most recent outing, this was the theme for my rustic pie, my favourites, chorizo and garlic being banished from this dish. In the larder were potatoes, a swede, carrots, onions, celery and few of the last tomatoes ripening in a dish, while a small tin of butter beans languished on the shelf. A pair of streaky bacon rashers from the fridge completed the list of ingredients, these to add a bit of fat and extra flavour. From the garden came a couple of rosemary sprigs, plus two bay leaves. Bringing these ingredients together would be a pint bottle of my home made dry cider to help tenderise the meat. Skin and joint the rabbit, discarding the pelvic triangle, while cutting the back and shoulders into three, to allow the meat to be left overnight in a pot to soak in water sprinkled with a dessert spoon of salt. This will leach out any remaining blood. The buck weighed about a kg and had enough meat for two 8 inch pies. Each one serving four people. Select 200 grams of each of the vegetables, peel and chop into cm cubes, cutting the celery into 5 mm slices, while roughly dividing the tomatoes. The butter beans will be added later, along with a tablespoon of tomato ketchup. Dry off the rabbit pieces. Heat a large frying pan, adding a tablespoon of cooking oil. Cut the bacon into 25 mm squares and lightly fry to brown on both sides, to bring out the fat, before browning off the rabbit to seal the meat. Remove from the pan and place in a casserole dish, covering the meat with the bacon. Now add the onions to the pan, turning until softened, removing and again covering the meat. Lightly pan fry the remaining vegetables, again turning to bring out the juice. Now add half of the cider, continuing to stir, until boiling for a few minutes. Remove from the heat and pour over the meat, deglazing the pan. Empty the bottle of cider into the dish and drop in the rosemary sprigs and the bay leaves. A pinch of salt and a good dusting of ground black pepper is needed before the lid is put on and the dish is put in the hot oven at 150 C.
After about 90 minutes, test the meat for tenderness, a large rabbit like this one will take at least two hours before the meat is falling from the bone. At this stage carefully take out the pieces with two forks onto a shallow dish and pull the meat from the bones with the forks, shredding the meat, making sure no small bits of rib, etc escape. Remove the rosemary and bay leaves before tipping the meat back into the casserole dish. Drain off the butter beans and add in, then stir in the tablespoon of ketchup. This will sweeten up the sauce and add a bit of colour. I have also added Worcester Sauce in the same measure in the past, while a few frozen peas, or sweet corn can also be thrown in for good measure. There are no real hard and fast rules with this pie. Place back in the oven, stirring every half hour, until the sauce has thickened and the vegetables softened. If you can resist eating the dish there and then, allow to cool, before making the pastry. In this instance, 500 g of shop bought short crust pastry was used, rolling out 5 mm thick discs to suit two 8 inch deep pie dishes. Lay the first layer of pastry into the dish and trim off to the edges, then put in the filling, topping it with a knob of butter, before covering with with the upper layer. The butter will melt down through the mix, adding a richness to the sauce. Trim and pinch to seal at the edges. An egg wash can be used to seal the top if required. It’s all down to time and presentation. 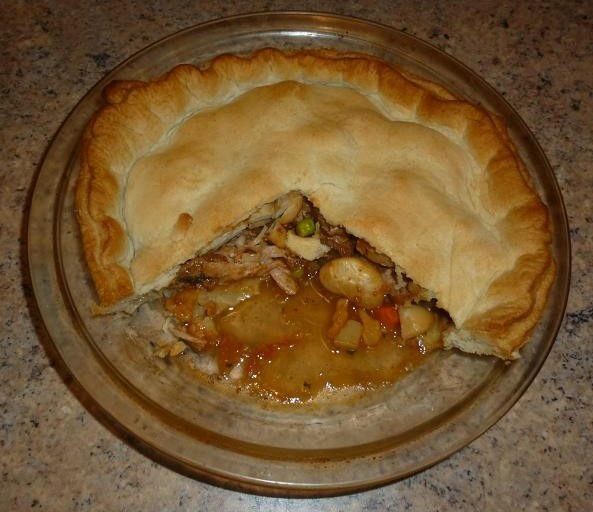 Pierce the top with a fork and the pie is ready for cooking later at 200 C for 30 minutes, or freezing. Much of my shooting these days seems to fit in with my wife’s desire to shop and with the countdown to Christmas ticking away, a request to visit our previous home town for a few hours browsing, had me weighing up the pros and cons of my various shooting permissions in the area. As I used to live within a mile of these various pieces of land, the days of a good bag of rabbits are long gone, but the need to keep my face in with the owners is important, whether I find anything to shoot , or not. I opted for the equestrian centre, where I can park by the stables and be on the path in minutes. Morning rain had given way to bursts of low sunshine, bringing out the colours of the autumn leaves, as I surveyed the fields at the start of my patrol of likely rabbit haunts. The parkland is divided off into pasture and rides bordering woodland, which give plenty of cover for hunter and hunted. 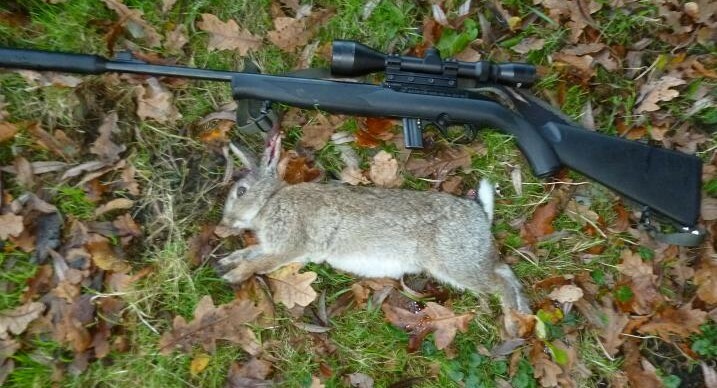 When I began shooting this old country estate, rabbits were everywhere and an hour walk round with my Webley Viper .22 air rifle, would often account for a dozen naive bunnies. Times have changed, the Webley stays in the gun cabinet and my weapon of choice is now the Magtech 7022 .22 semi auto, the scarce quarry often being beyond air rifle range, while the 40 grain hollow point RWS bullet provides instant stopping power. This is true hunting territory requiring all the senses, with a slow approach, checking out small clearings and under bushes along the way, lifting feet, then placing them ahead, instead of striding along. The first few hundred yards had drawn a blank, not even a flock of feeding pigeons; they were all in the trees overhead, hidden from view, until they clattered out of the branches, sweeping low across the fields. 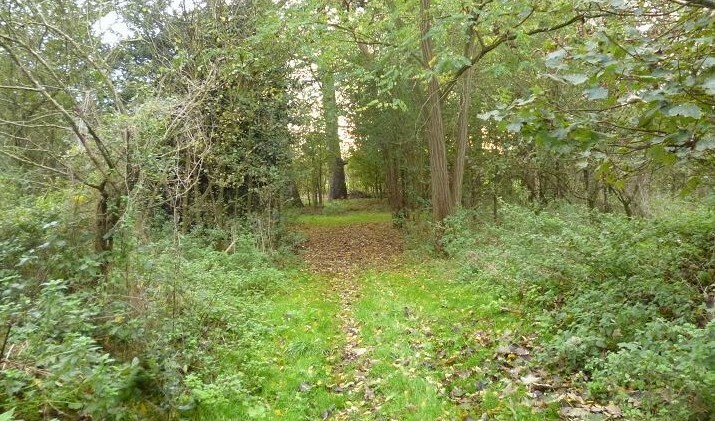 The path turned and entered a wood, where I stopped at an area of disturbed ground. Something larger than a squirrel had very recently been digging up the grass, possibly a badger, or rabbit. Scanning the undergrowth, the sound of a small animal moving away through the leaf litter, gave me a brief sighting of a rabbit twenty yards away, before it disappeared again. Moving forward, I rested against a tree and waited for movement. More rustling of leaves and a large buck trotted out into the clearing, halting long enough for me to get the cross hairs on it’s head and squeeze the trigger. With a half jump forward, it toppled over motionless. The rabbit was paunched where it fell, to lighten the load in my game bag, before continuing down the path. Rounding a laurel bush, a pair of rabbits were feeding at the wood edge about sixty yards away, partially shielded by young trees and tried to use the trunk of a tree as cover to get closer for a better shot. Peering out from behind the trunk, they were gone. Back into the wood. This time there was no second chance. I could have taken a shot from sixty yards, but a miss, or worse, a wounded animal may have been the result. I already had a large rabbit in the bag and wasn’t desperate for another. Further on through, where another path joins the main one, I eased the rifle round the corner and viewed another feeding rabbit unaware of my presence, taking my time to line up for a chest shot. The near silent report from the moderator was drowned out by the thud of the bullet striking home and number two was in the bag. The ground here is pock marked by rabbit holes, being one of my banker areas on a blank day. If I waited around for twenty minutes, another would pop out from the hedge, but I see my job as pest control, not eradication. The path now came out of the wood, skirting the boundary edge and apart from a rabbit that came out onto the ride forty yards ahead, then dived back before the rifle could be raised, I saw no more. Getting half way round the circuit, cutting across to where the ride passes through an ancient sunken, tree filled lane, I approached another of my banker areas. At the edge of the trees is a grass lined bank, with a view over the brow, down the grassy ride. Pressing hard into the undergrowth, I belly crawled up the bank to see a rabbit head down facing me. As I moved out from the edge to take the prone, thirty yard shot, it raised it’s head, only to flip over in shock as the bullet struck home. Getting up to collect this one, flashing white tails bobbing down the ride meant more work to be done, but not today and on the half mile walk back to the stables, a couple more distant sightings proved to me, that more visits are required before Christmas. Reaching the stables, the owner’s wife was busy sorting out tack, but had time for a chat, happily accepting a fresh rabbit for the pot, while confirming that the shooting was exclusively mine, as long as I wanted it. Music to my ears. 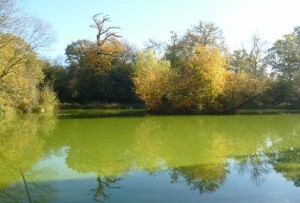 Breadpunch and red worm fishing the autumn pond. An Indian summer had brought record 20C temperatures for October and I had a new pond in mind to fish, but as happens, other priorities such as clearing the garden ready for winter and days out driving my classic MG, or motorbike rides, had pushed fishing further down the list. Now with temperatures back down to seasonal levels, the weatherman forecast a bright dry day and I set off in sunshine, after the morning rush hour, for a hoped for full day of catching fish. 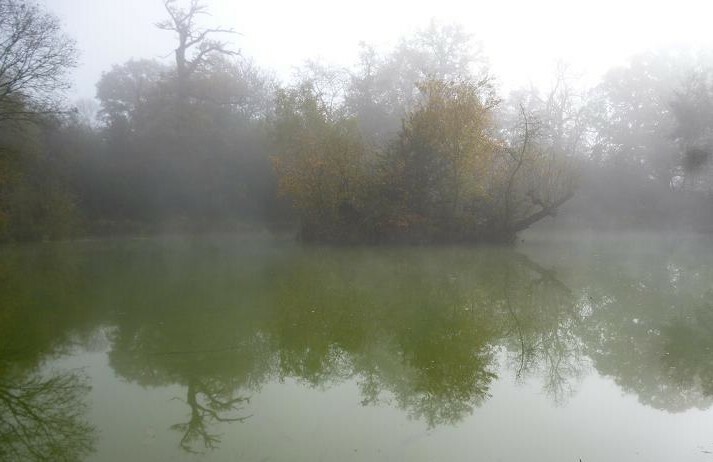 The pond lies in a valley and and as I crested the hill, the sun faded from view due to a heavy mist shrouding the area and damping down my optimism. My mood was not helped by the crunch of ground frost underfoot, while crossing the open field towards the tree lined water. Negative thought number three came with my first sight of the surface. It was bright green with a film of algae. Despite all of this, fish were moving and I set up my pole with a heavy elastic, as the pond has a reputation for some decent carp, but my target fish were the also the reputed crucian carp, so a compromise was needed. A rig used on my last outing to my local pond was clipped on, 5lb line through to a size 14 hook on a 3lb link and a light weight 0.2 g float. Plumbing the depth, a 2 ft shelf gave way to 3 ft deep, 4 metres out, which continued out to 6 metres. Not deep, but deep enough to avoid being affected by the frosty conditions. 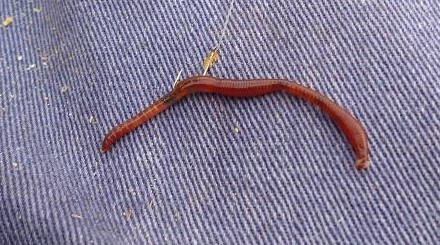 With liquidized bread and punch slices from the freezer as my main bait, I’d raided my compost heap for some red worms before setting off, to give an alternative. Mixing up some bread based groundbait, I put in several egg sized balls along the 5 metre line to carpet the bottom. My first put in saw the float stay flat, as a fish took on the drop, then slide beneath the green surface. A lift of the pole and a thumping, hand sized rudd was pounding away, before being swung in. 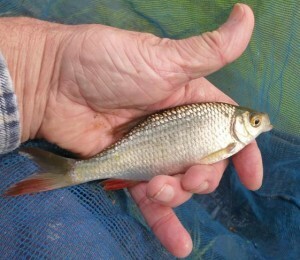 Small roach and rudd queued to get on the hook for the next fifteen minutes, but bubbles bursting in the surface film indicated better fish moving onto the feed and the bites changed to dithering dips, followed by a slow sink. A crucian?A strike was met by a soft bounce, as a skimmer bream skated beneath the surface, before being skimmed across the top into the landing net. Where did this come from? A lone fish? 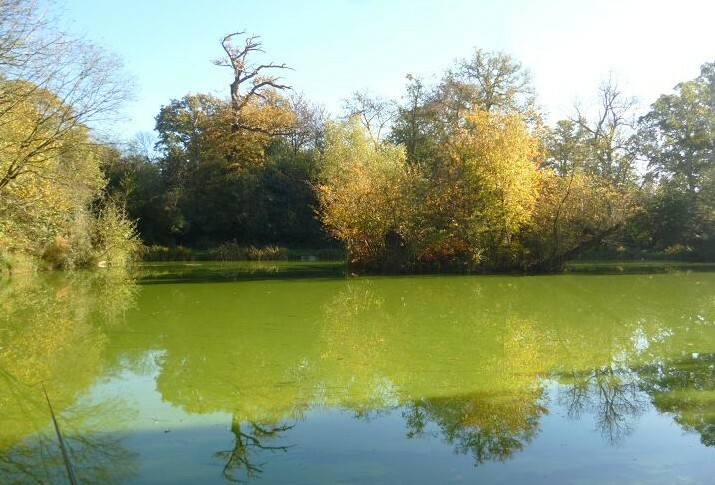 I hadn’t heard of bream in this half acre pond before. Next cast an identical bite was met by more resistance and a deep thudding fight as a much larger bream fought in the dark green gloom of the pond, guessing the species long before I saw it to slide over the net rim. More skimmers followed and the net was beginning to fill, as the local church bell struck noon to bring with it warming sunshine, burning off the morning mist. The air warmed immediately, as the sun worked it’s way round to my shaded spot. Up to now it had felt more like winter, the water from my wet landing net, soon soaking my legs and chilling me through. Travelling light due to the walk to the pond, I’d only taken the bare basics to fish and with a dry afternoon in the forecast, the waterproofs were first to go. With the sun, the bites changed again, fast bobs and jabs of the float telling me that crucians were now around, the juddering fight confirming my suspicion, before guiding a chunky 8 oz carp into the net. 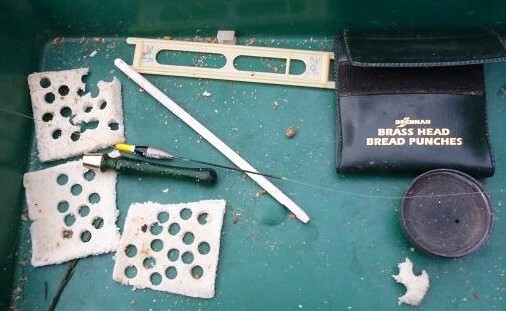 A few more crucians and skimmers were in the net, then the bites slowed down, the bread punch pellets being sucked off the hook without developing into anything hittable. A drop in punch size from 7mm to 5mm got me catching again, but still the bites were slow and I reached into the bait box for one of my red worms. The float had barely settled, before it dipped and lifted slightly, then moved steadily towards deeper water and sank out of sight. I lifted into it and watched the elastic drawing out of the pole tip. This was much bigger, the slow movement against the tension and the lazy bottom hugging fight saying proper bream. It turned and began churning up bubbles from the bottom in the baited area, pulling it away to the side, where it rolled on the surface a few times, before giving up and lying on it’s side, the deep bronze of it’s flanks glinting in the sun. With a foot to go to the landing net, it did a surface flip and the hook flew from the skin of it’s lip. I made a lunge with the net, but only caught the tail section of the wallowing bream, before it was engulfed by the green water. The still intact worm was recast and sank away within a minute. I struck and felt the weight of another decent bream for a moment, before it too came off. I’d been giving more time on the strike than the bread, but not enough. With two good fish lost, I rested the swim as I mixed up some more feed, putting in three balls. Feeding the swim is always a gamble once colder days come, it’s so easy to overfeed the fish. 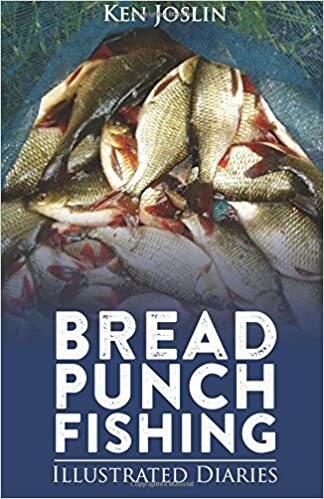 With bread going in, I switched back to the punch. 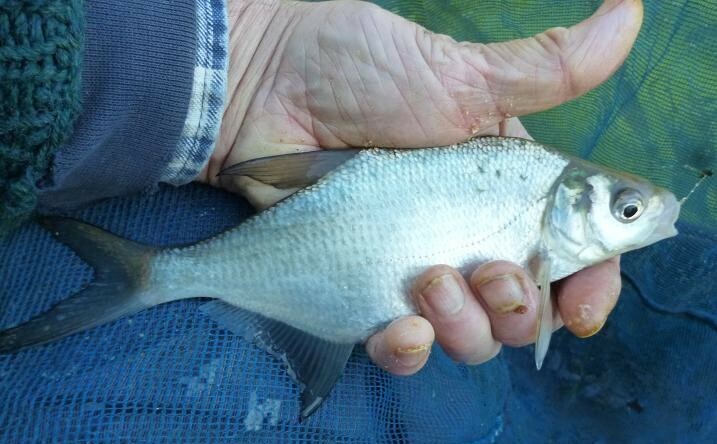 I needn’t have worried about over feeding, the float sinking away as it followed the last ball and I was into another of the better sized skimmers, taking care not to bully this one to the net, another lost bream could take the shoal with it. A smaller bream and a few roach on the punch saw me reach in the box for another worm. This time the float dithered around for a few seconds, then moved off with purpose. Giving plenty of time for the fish to take the worm, the float was gone with the line following, when I gave a firm lift of the pole. The straight line run that followed, with the elastic zooming after it said one thing, carp and the next five minutes were spent countering runs, adding and removing pole lengths as it made full use of the open water. A flash of gold, as it rolled on the surface, told me that the fight was won and I slipped the net under a 2 lb common carp. 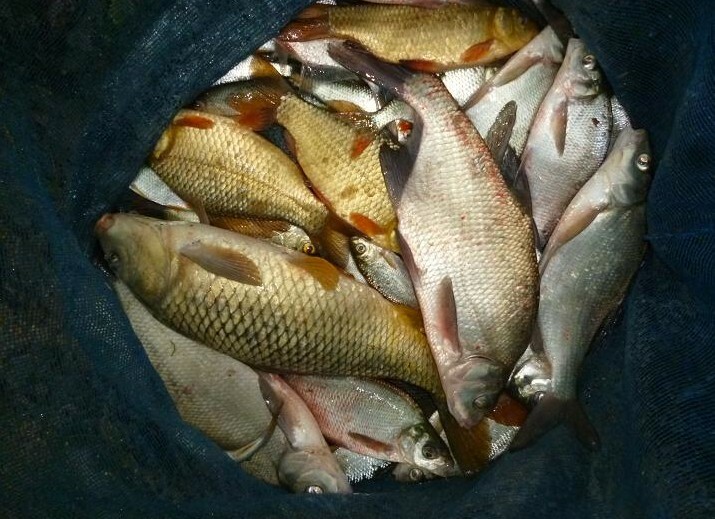 Clouds were now scudding across the sky, it seemed like the weatherman had got it wrong again, but the bubbles were still rising from the baited area and the worm was working well, with another crucian and more skimmers going into the keep net, being well on the way to my best catch this year. The church clock had barely rung out the second hour of the afternoon, when droplets of rain began to patter down, a passing shower I hoped and pulled the hood of my jacket over my cap. I looked back and couldn’t see my float, studying the surface long enough to see the line straightening. A lift of the pole had the elastic out again, this time arcing round to the left. 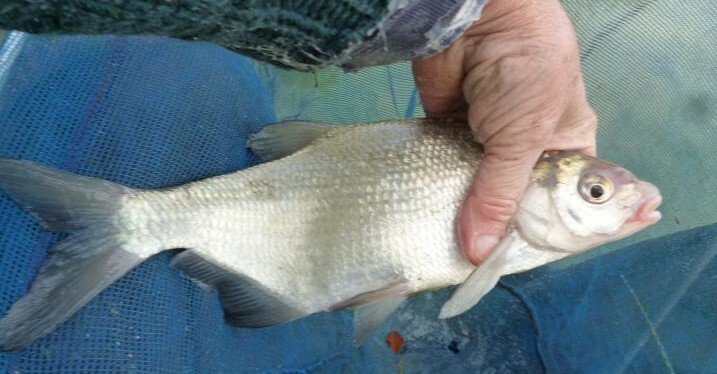 At first I thought it was another carp, but the soft thudding bounce on the end said another bream, which was giving a good account of it’self, skating all over the surface like a much smaller fish. By the time I had netted this fish, the rain was lashing down and the light was going, as a black cloud swept overhead with a rolling clap of thunder. 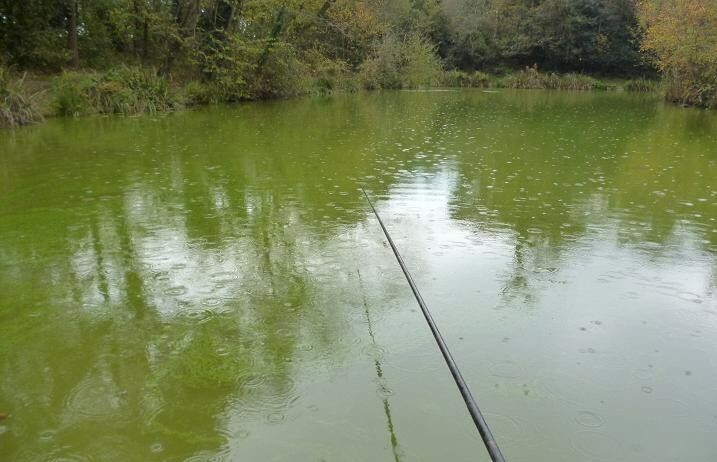 With my bait tray already awash, I didn’t need persuading to pack up as quickly as possible, everything was soaked in the ensuing deluge, another thunder clap much closer this time spurring me on, the carbon pole the ideal lightening conductor. It was so dark by 2:30 pm, that I needed flash to take this picture of the 9 lb 8 oz net of fish, the session cut short by two hours with me beating a hasty retreat through the wood and across an open field with the elements from the freak unforecast storm, forcing me home to a welcome early bath.